Johns Hopkins US Family Health Plan (USFHP) has a new address. Please note the following important changes. There is a national shortage of Shingrix—the shingles vaccine. Physician offices and pharmacies across the country are experiencing difficulties with keeping the vaccine in stock because of increased demand. The CDC has listed the vaccine on the National Vaccine Supply Shortages list. If you are experiencing difficulty obtaining the vaccine at any JHCP site or provider, you can call your pharmacy and place your name on a waiting list. The pharmacist will call you when they receive their next allocation. Due to a mailing error, a letter intended for members of the TRICARE Young Adult plan was sent to members who are not in that plan and shouldn’t have received the letter. If you or a member of your family is not enrolled in TRICARE Young Adult, please ignore this letter. If you are a member of TRICARE Young Adult, this letter has important information about premium changes for 2019. If you did not receive this letter, you will soon. Time is Running Out: Switch to Walgreens! On Jan. 1, 2019, Rite Aid will leave our pharmacy network and Walgreens will become Johns Hopkins USFHP’s exclusive pharmacy provider. After Dec. 31, 2018, we will no longer provide coverage for prescriptions filled at Rite Aid Pharmacies. If you are still using Rite Aid for your prescriptions, you will need to transfer these to a Walgreens pharmacy. Online: Create an account at Walgreens.com and enter your prescription number. In Store: Bring in your prescription bottle and insurance card. Mobile App: Scan your prescription bottle and insurance card. The Defense Health Agency has notified us of a change to the TRICARE Young Adult (TYA) Plan monthly rate for plan year 2019. Effective Jan. 1, 2019, the rate will increase from $324 per month to $358 per month. TYA rates are paid a month in advance, so members will be charged with this rate for the first time on Dec. 15, 2018. Questions? Call our Premium Billing Specialists at 410-424-4835 or toll free at 888-717-8282. We have some exciting news regarding your pharmacy network! Johns Hopkins US Family Health plan has added all Walgreens pharmacies to your network—that’s 8,100 locations and growing. In addition to convenient locations, Walgreens has many digital tools to help you manage your medication and easily refill prescriptions. Beginning July 1, you may begin using any Walgreens to fill your prescriptions. You should have received a new member ID card as a result of this pharmacy network change. Please use the new card and discard the old one. If you have not received your new card, contact [best number]. Online coordination of benefits for pharmacy coverage will be available soon. If you have prescription coverage through another health insurance plan, your pharmacist will soon be able to submit your prescription online to both plans at the same time. We will end our partnership with Rite Aid on 12/31/2018. Before this date, if you are still using Rite Aid for your prescriptions, we will contact you to help you find a convenient Walgreens. Again, we have added all Walgreens pharmacies to your network, and you may begin using any Walgreens on July 1. Remember that hundreds of former Rite Aids that converted to Walgreens are included—these stores may still have Rite Aid signage. If you have any questions about this information, please call Customer Service at 800-808-7347. If you are already sick with the flu, stay home, rest, and drink plenty of fluids. Don’t go back to work or school until your fever has been gone for at least 24 hours without medicine. Learn more about the flu. Interact with your local military community—Like and follow us on Facebook for family resources, industry updates, health and wellness tips, and more: facebook.com/JohnsHopkinsUSFHP. 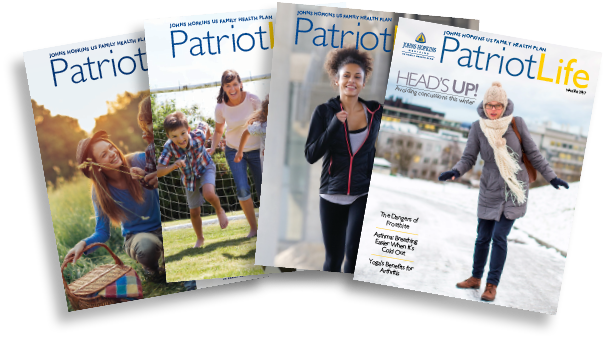 Check out our newsletter, where you’ll find preventive care information, USFHP benefits in action, and feature stories about our great members and staff!